Many of you will already know that for many years now we have specialised in the repair, service & restoration of hand-wired valve (tube) musical instrument amplification, including many of the “boutique” grade amps that have appeared on the scene since the 1990’s. 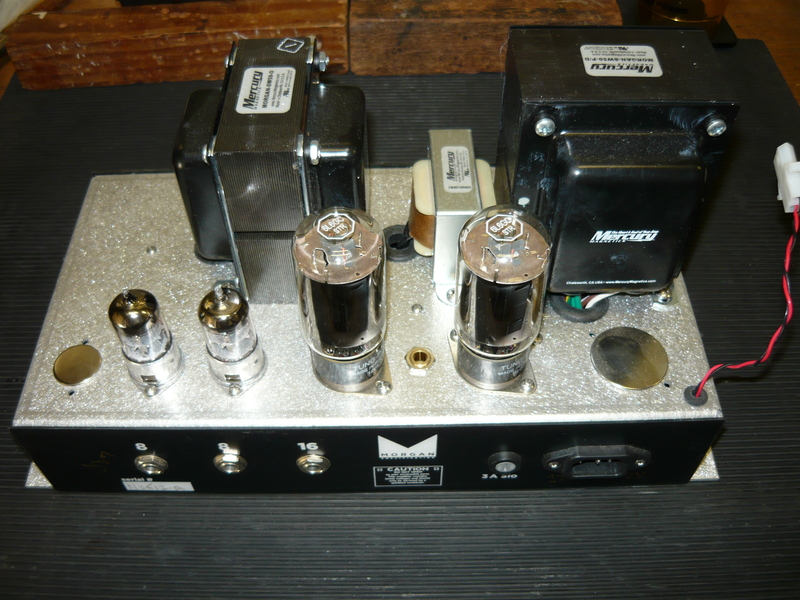 This is our first customer repair job for a relative newcomer to the “boutique” scene, the Morgan amp from California. 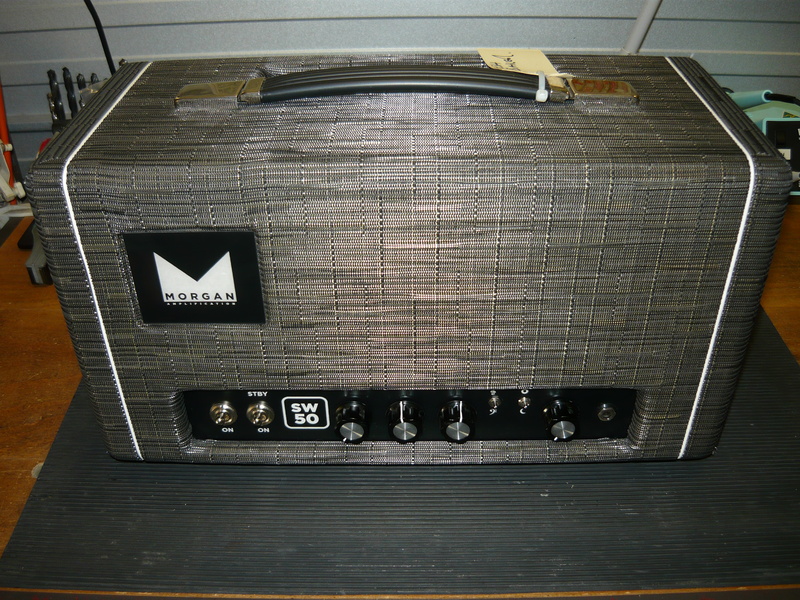 The Morgan amps have enjoyed an increased profile in recent times, and have appeared in numerous YouTube demonstrations. This particular model is known as the SW50, and is a stripped-down, single channel dual 6L6 powered amp delivering approx 45 watts @ the onset of clipping. The power supply is quite conventional, employing silicon diodes for rectification. The transformer & filter choke set is by Mercury Magnetics. The Morgan website implies that the design of this model is loosely based on the clean channel of a customer’s early 1970’s Dumble amp. 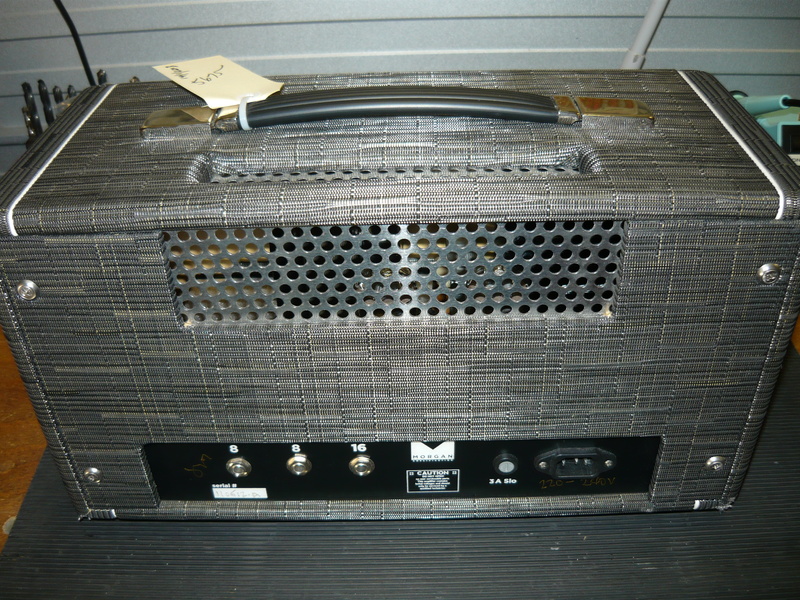 Clearly, the design was revoiced & refined quite significantly to become the SW50, which is primarily a clean, percussive amp with very late break-up. The 2-band EQ is more interactive than a “Blackface” Fender, for example. The bright switch is very effective at low settings of the volume control, the bass switch is obviously Dumble inspired but unfortunately primarily boosts very low frequencies and is best left off. The SW50 is actually quite dark running with the volume control set high and the level (ie, master volume) set low. Conversely, the SW50 is quite bright with the volume control set low, and the level set high – this is when the bright switch is most effective. There is more than enough bottom-end with the bass switch off. 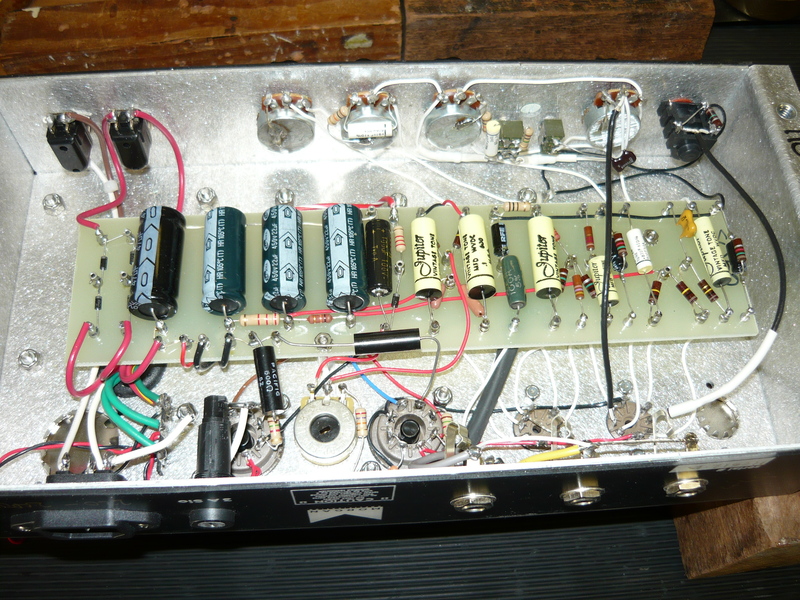 The preamp employs a single JJ 12AX7 valve (tube), plus a 2nd JJ 12AX7 for the phase-inverter stage. This particular Morgan was creating some weird resonances on selected notes being played. 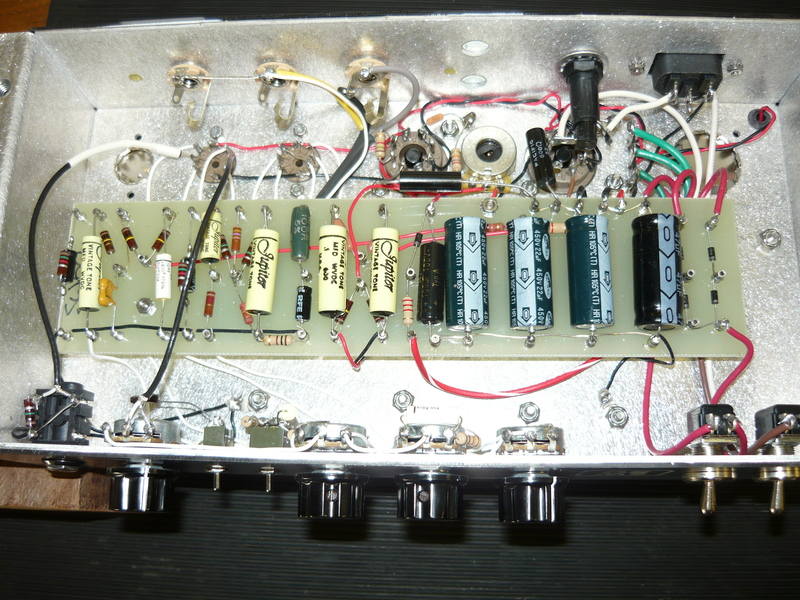 We discovered that V1 was microphonic, and the pair of SED 6L6GC output valves (tubes) was in very poor condition, with a much weakened internal structure vibrating at selected frequencies. The amp was under-biased, meaning that the 6L6’s were running far too hot for long term reliability. We installed selected replacement valves & rebiased for a more reasonable current draw. On power output test there was no crossover distortion evident and we measured 19V/8 ohms which is 45 watts, @ the onset of clipping. Mains voltage here in Wyoming NSW is approx 245V AC. I should point out that at this point in time we have no official relationship with Morgan amps, we are not an authorised warranty agent. However, we are now offering world-class non-warranty service/repairs to all Morgan amps for Australian customers. Regards – Ivan Richards. 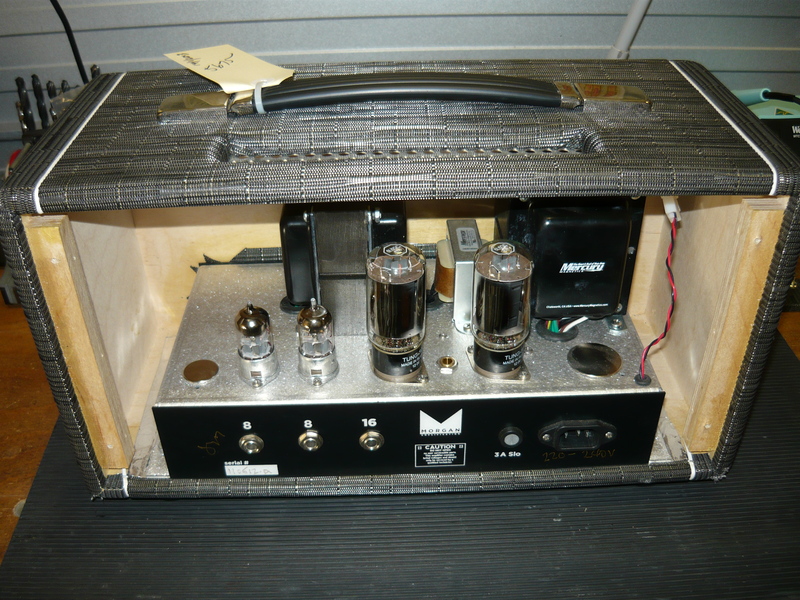 This entry was posted on January 16, 2013 at 11:24 am and is filed under Amp Repair, Amps. You can follow any responses to this entry through the RSS 2.0 feed. You can leave a response, or trackback from your own site.